REBT practitioners are encouraged to read Not. To oversimplify, Not will help you target “musturbatory” thinking (a.k.a. demandingness) more effectively by targeting “must not” instead of any and every strong “must”. The information on this page can be found in both Journal Journey from Ego and What’s Your Story? REBT, Rational Emotive Behavior Therapy, is a deeper form of psychotherapy than either of its main look-alikes: Cognitive Therapy (CT) and Cognitive Behavioral Therapy (CBT). REBT works with underlying identity issues by continually teaching USA, unconditional self-acceptance. REBT works with underlying relationship issues by continually teaching UOA, unconditional other-acceptance. REBT works with underlying existential issues by continually teaching ULA, unconditional life-acceptance. 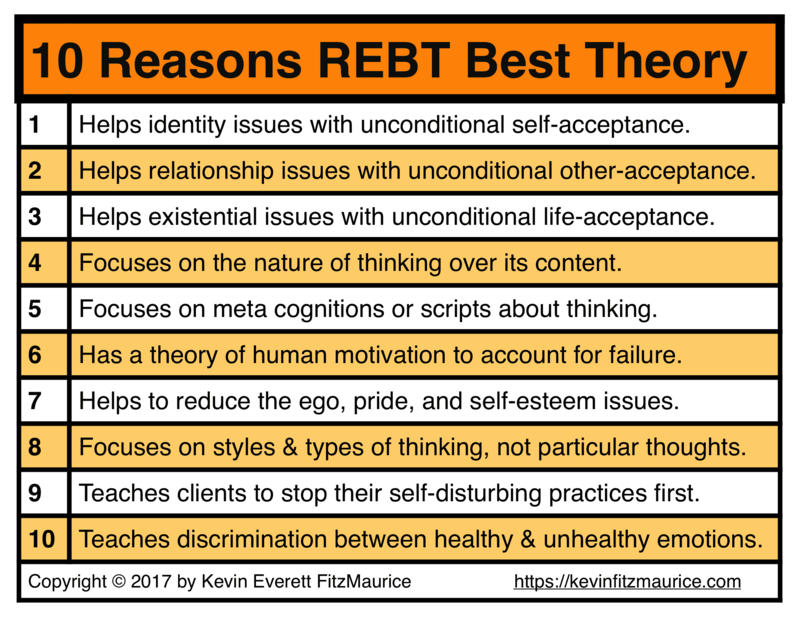 REBT works to recognize and remove the models common to all self-disturbing and self-defeating thinking by emphasizing the nature of thinking over the content of thinking. REBT has always taught counselors to focus on metacognitions, which are thoughts that direct or interpret other thoughts. REBT does this by first focusing on the client’s problem about their problem (for example, their anxiety about their anxiety). REBT Is Deeper for 2 Practice Reasons (requires an understanding of REBT’s ABCs of Emotions). This section requires an understanding of REBT’s ABCs of Emotions. It is important to emphasize one of the major differences between REBT and other cognitive therapies such as CT and CBT: CT and CBT typically dispute the B about the A, trying to lessen the emotional upset by lessening the distorted view of the event A. REBT, as Albert Ellis often put it, disputes the B about the A more elegantly, trying to lessen the emotional upset by lessening the inflexible and extreme negative nature of B. In fact, REBT may not only accept the distorted view of A at first but often actually exaggerates the distortion of A to absurdity, to teach the point that, even if A is a real pain, B does not have to be an additional pain source. (Or, as FitzMaurice tells his clients, “Why double your trouble? Isn’t it already bad enough that you have a painful A? Why give yourself a painful B to go along with it? !”) Once the self-defeating effect of B is sufficiently reduced, REBT will also concern itself with removing distortions of A at B and even problem-solving A. Ellis characterized this as the “elegant solution” of REBT. 1. This is an important point that is lost even on some of the trainers from the NYC Institute. REBT works mostly on the nature of B, rather than on the mere content of B (which is what CT and CBT do). This leads to greater generalization or application of therapeutic gains, including insight, awareness, feeling, and behavioral change. For instance, if–as in CT–you focus on the content of the B rather than on the nature of the B, then you must approach each B individually. Disputing one particular B only teaches you how to dispute similar Bs. However, if–as in REBT–you focus on the nature of the B, then you can approach any B with the same fundamental tests for rationality, helpfulness, logic, and reality. Tests for rationality (such as flexibility versus rigidness and acceptance versus demandingness) can be applied generally. The tests developed in CT are less efficient, effective, and forceful because they target the side effects rather than the goals of thinking. A = client receives a compliment. B = client discounts and denies the compliment. C = client feels unworthy and unappreciated. CT might focus on the content of B as the client’s use of the thinking error of minimizing. CT would then help the client to see how minimizing and discounting compliments keeps them stuck feeling unworthy and unappreciated. This can be a valuable and helpful learning for the client who now has the opportunity to learn to use minimization less–at least when receiving compliments. REBT might focus on the nature of the B as an example of the use of the irrational thinking of absolutism, extremism, or rigidness. REBT would then help the client to see how their use of rigid thinking with problems, issues, and relationships in their life leads to manifold problems, such as intolerance, misunderstandings, rejection, and unnecessary conflicts. Now the client has a general understanding of how a rigid attitude and approach to life is interfering with their life goals, health, and happiness. The client now has the opportunity to make a philosophical change to practice more flexibility, openness, and tolerance in their life for a generally improved life. 2. REBT’s approach is a deeper approach because it teaches clients to first stop disturbing themselves rather than to first try to get the world to stop disturbing them. Once clients are less disturbed, they are naturally then better able to realistically and practically work at making their world a more convenient, friendly, and nurturing place. REBT Is also Deeper Because of its Emotional Realism: 10th Reason. REBT recognizes that some emotions are helpful and some are hurtful. For instance, REBT sees extreme negative emotions (such as depression and anxiety) as hurtful, but REBT also sees mild to moderate negative emotions (such as mild regret or concern as helpful). Other counseling theories often make the foolish and unrealistic claim that all emotions are okay despite the fact that some emotions lead to violence and abuse, while some other emotions lead to peace and compassion. While most therapies work to help clients overcome and move beyond certain types of feelings, only REBT is honest and straightforward enough to list feelings as healthy or unhealthy. Most therapies say that all feelings are acceptable, but then they hypocritically try to help you get past ones that you or they find disturbing. It is REBT’s view that some feelings indicate that you are overreacting due to your irrational thinking. Hence, REBT clearly lists what feelings it theorizes are self-defeating and suggests alternative feelings. REBT neither implies nor wishes that you have fewer feelings. REBT neither implies nor claims that you can have only positive feelings. However, REBT does promote the belief that many feelings are extreme, exaggerated, or unhealthy responses that tend to make matters worse, not better. You can often modify feelings to make them healthy instead of unhealthy by adding “a little,” “somewhat,” or “mildly” before them. “REBT’s Insight No. 1 holds that you have both healthy and unhealthy emotions.” ―Albert Ellis, How To Stubbornly Refuse To Make Yourself Miserable About Anything–Yes, Anything! For chart listing examples of both kinds of feelings, please read either Journal Journey from Ego or What’s Your Story?